Earlier this summer I was poking around the Vancouver Parks Board website & came up with the idea to make a list of all the spray parks in the city & try to visit every single one this summer. I made a checklist (of course--I love checklists!) 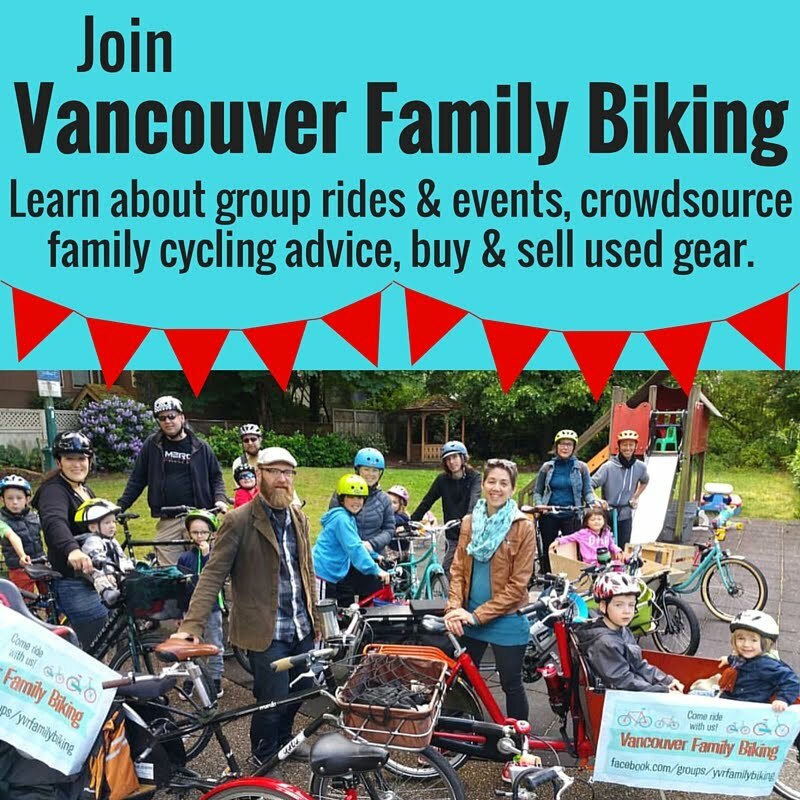 which you can grab from the Vancouver Family Biking Facebook group in the Files section, if you want it. We haven't made a huge amount of progress, despite the summer being half over. Here are the spray parks we've been to so far. This one is a bit off the beaten path for us, but we trekked over to Kits to see it after going to the Let's Go Biking Book Launch event along the Arbutus Greenway. It is right along the 10th Avenue Bikeway, so it's quite nice to ride to. It is a cute little spray park with painted concrete surface, several different sprayer things, no water guns & SO MANY GEESE. 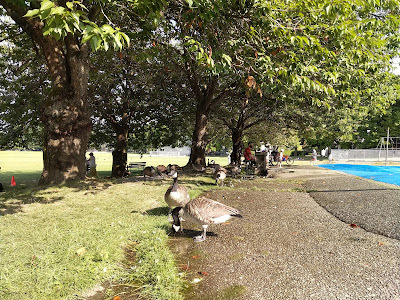 The geese mostly stayed away from the kids, moving back & forth from the field to the edge of the spray park while we were there. Until the water sprayers turned off after the kids took a break for a while. While the kids were playing in the adjacent playground, the geese invade the middle of the splash pad & POOPED all over it. Bleagh. This is a park we often bike through on our way to & from Stanley Park, but we rarely stop at. The spray park is very minimalist, no rainbow coloured pipes or giant ladybug things to climb on, but more like a fountain. Nonetheless, the kids looooved running around between the spouts of water. There are plenty of shaded benches on either side & the mist from the water blows over toward them intermittently, which is fantastic on a hot day. 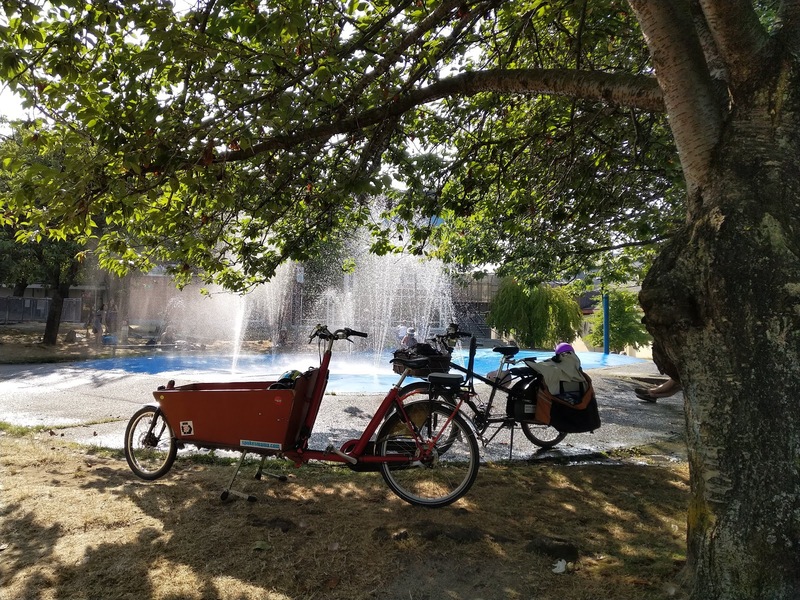 The park also has public washrooms on the south side of the spray park & it's easily accessible by bike as it's right along the seawall. This is our default spray park, only a few blocks from home. 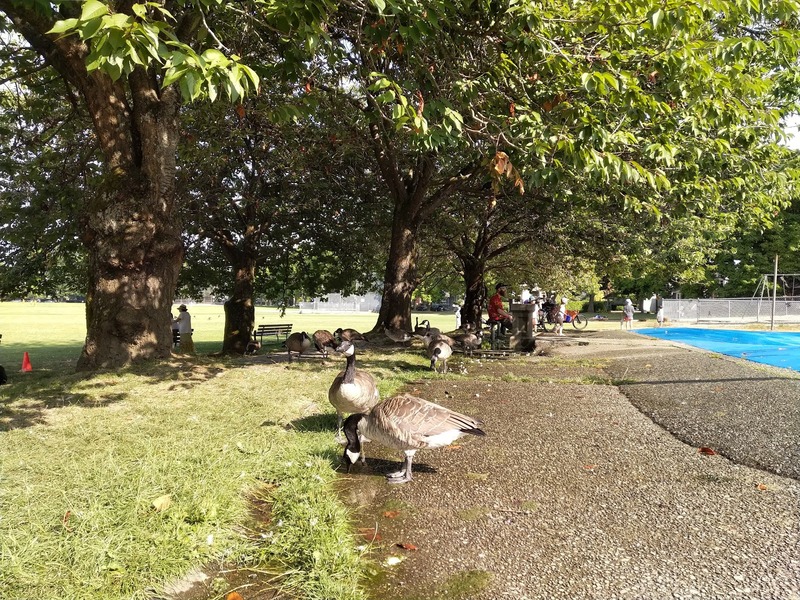 It features a small splash pad with a variety of sprayers & water guns, a bioswale artificial "stream", public washrooms, plus a large shady area right next to the spray park that has a couple of picnic tables. 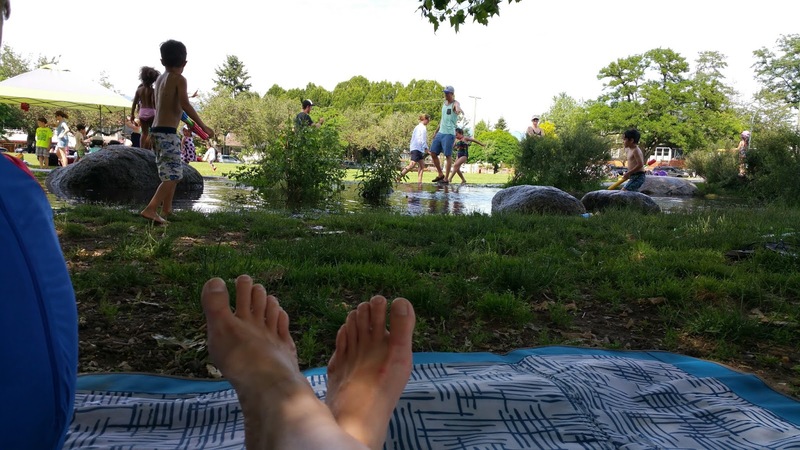 There is a good playground with lots of swings, as well as a small community garden & a playing field--definitely a place you could spend the day with kids. I'll post again once we've visited a few more spray parks in the next couple of weeks. 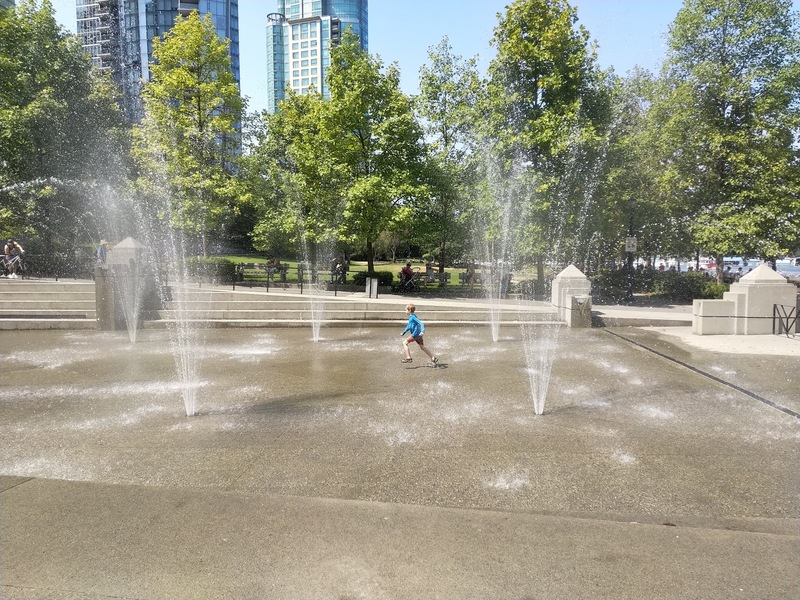 Have you been to any of Vancouver's spray parks? Which one is your favourite?